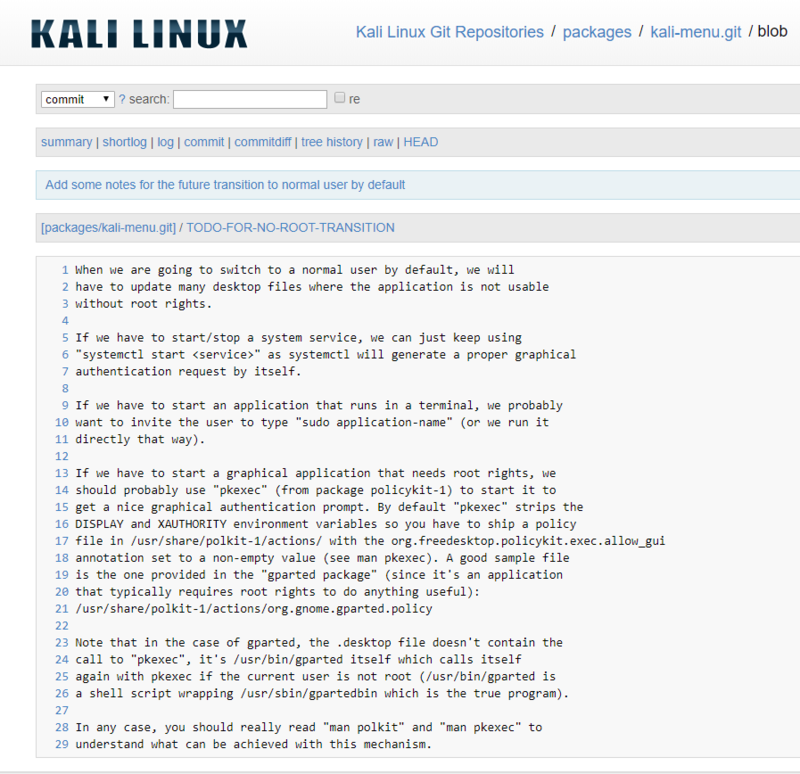 On April 6, 2018, a file called TODO-FOR-NO-ROOT-TRANSITION was added to the repository of the package responsible for the Kali Linux menu. The file is small and contains technical information with reminders addressed to the maintainers of Kali Linux, what they need to pay attention to when they create shortcuts for the program menu. When this transition will be made and whether it will be made at all, it is not known. This task is not super complicated, and if the decision on the transition is already taken, then already in the next release, or through the release default user can become a user without elevated privileges. The file itself says that when the transition is made, many desktop files (responsible for menu items) will need to be updated for applications that can not be used without root rights. If ones have to start/stop a system service, maintainers can just keep using "systemctl start <service>" as systemctl will generate a proper graphical authentication request by itself. If ones have to start an application that runs in a terminal, maintainers probably want to invite the user to type "sudo application-name" (or maintainers run it directly that way). If ones have to start a graphical application that needs root rights, maintainers should probably use "pkexec" (from package policykit-1) to start it to get a nice graphical authentication prompt.